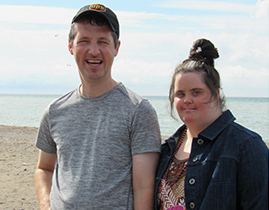 Community Living Chatham-Kent provides a variety of services and supports to adults who have and intellectual disability. Together we can identify goals, dreams, resources, and the options available for people to participate in their community. The Day Programs at Community Living Chatham-Kent provide life enriching activities that promote skill development, and community connections, while supporting the needs and choices of people to enhance their quality of life. Community Living Chatham-Kent offers Day Programs at 3 locations that promote skill development, enriching activities, community connections, and provide respite for families. People are encouraged to direct their supports based on personal preferences and interests. These are voluntary recreational based leisure programs designed to enhance activities of daily living, provide personal care, and supports to meet people’s needs. In addition to life skill training, we offer recreation, fitness, crafts, a computer lab, and community based activities. Our Fun Friday evenings provide a fun break until 8 p.m. for people who participate in the programs and live at home with their families. People attend the Day Program on Park Avenue voluntarily. They engage in fun, social, recreational, educational activities. The activities are based on people’s goals, interests, and needs. Community Living Chatham-Kent provides a variety of 24-hour and less than 24-hour residential accommodations. Our focus is to provide people with the supports needed so they can participate in the community, and enjoy their home. We provide people with the supports needed so they can participate in the community, and enjoy their home. Assist with day-to-day routines based on personal preference and needs. Monitor medical, dental and specialist consultations and provide follow-up as needed.